The boot process of Ubuntu GNOME in general is very similar to any part of the Ubuntu family, except, perhaps, Lubuntu that still uses the old-style loader with initial menu. The new version of Ubuntu loader, including the GNOME edition, does not ask you any questions before you reach the graphical environment. At this moment you have a choice to run the operating system in Live mode (Try) or to install it onto your hard drive. Of course, my choice was for the Live mode. The only difference between Ubuntu GNOME edition and the main Ubuntu release is that you don't see 5 blinking dots on the boot screen. Instead, there is a Ubuntu GNOME logo in a rotating circle. Once booted, you are greeted with a standard GNOME screen. In the centre of the screen there is a window with help for GNOME navigation and other frequently used functionality. The top part of the screen is taken by the black-coloured panel. The left part of the panel is called "Activities". If you move the mouse to that area, your current window reduces in size, and you can see all the active windows and switch between them. Also, a quick access panel appears on the left, virtual desktop switcher on the right, and application search field in the top-center part of the screen. Clocks take the central part of the panel, while battery, network and volume indicators are on the right along with the additional drop-down menu. The desktop is in simple, even boring blue-toned wallpaper. However, you can change it easily, and there are about 20 alternative images in the default distribution. If you've never used GNOME3 before, you would be surprised that there are no maximize and minimize buttons on the window. You can maximize and restore a window by double-clicking its title, or by right-clicking the title and selecting the menu item. Minimization option is only available through right-click menu. There are also other tricks and hotkeys. You can get more information about them using the help window that I have mentioned at the very beginning. The freshly booted system takes about 460Mb of memory, which is quite a lot. It is on par with Ubuntu 15.04 but still much less than Fedora 22 GNOME. There were no technical issues with connecting my laptop with Ubuntu GNOME 15.10 Live to my home wireless network. Ubuntu and its family of operating systems deals with my wireless card Realtek 8191SEvB easily. 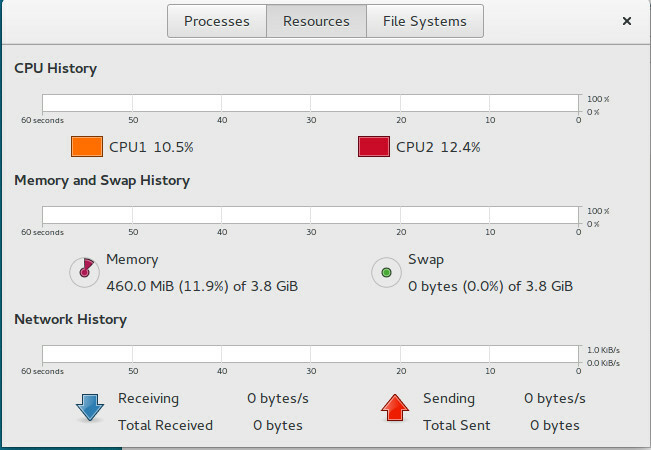 The only complaint from me is that network connection requires too many clicks in GNOME3. However, it's not something most of you do on a regular basis, so that's not a show-stopper. Ubuntu GNOME's file manager has an option to browse the network around you. Using that function, I navigated to my shared network drive and connected to it in no time. That's easy! Ubuntu GNOME comes with English US keyboard layout by default. If you want to change it, navigate to the "Region and language" section of the system configuration panel and add or remove layouts there. Once done, you may need to navigate to the "Keyboard" part of the same configuration panel, where you can configure your keyboard hotkey for layout switch. This configuration is in the "Typing" section of the keyboard settings window. Unfortunately, my favourite keyboard switch method, Ctrl-Shift, is not supported by Ubuntu GNOME. Two-finger scrolling is enabled in Ubuntu GNOME 15.10 by default. If you prefer a "classical" scrolling by the touchpad edge, you need to change your preferences in the Mouse&Touchpad part of the configuration panel. Mouse movements in the default configuration were just too fast for me. I slowed it down in the same configuration window. 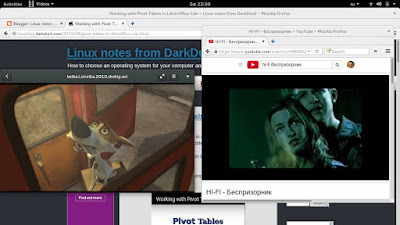 Totem Movie Player is the default multimedia player in Ubuntu GNOME 15.10. When I tried to play an MP3 file, it asked me to install necessary additional codecs. I agreed, and actual installation literally took seconds. Restarting Totem was the only outstanding activity to listen to MP3 music. The same was applicable to movies that I have on my computer. Damn good job! I am not sure whether the installation of the packages for local playback helped this, but when I navigated to YouTube, all the videos played without any issues, both in native and embedded modes. The only issue I could see there is that when several videos were open on several tabs of the Firefox browser, the computer started lagging a bit. Ubuntu GNOME 15.10 comes with a quite small selection of applications in the default distribution. You can see the full list clicking the bottom button of the left panel. There are just 2.5 screens in the list with 24 applications on each screen. It makes the total just above 50, including all the system tools, help, configuration elements and so on. Unfortunately, applications in the GNOME3 list are not divided into sections. The list is absolutely flat. You can only filter them by typing the application name in the search bar. I'll list just few applications here: Firefox 41.0.2, LibreOffice 5.0.2.2, GParted, Rhythmbox, Evolution. Of course, all the Ubuntu repositories and PPAs are also available for you. No need to worry about the ability to install your favourite software, as long as it exists for Ubuntu. Generally speaking, I would prefer to see a bit more useful applications in Ubuntu GNOME, and also to see some kind of grouping in the applications list. But I think my requirements are too outdated for the GNOME3 team. If you like GNOME3, you will find that Ubuntu GNOME 15.10 is a good and reliable system for you. Apart from small performance issues in the browser, I had nothing major to report in the "problems" area. Basically, as soon as you say "Ubuntu", you are already in the area of well-tested and problem-free all-rounders, especially if the distribution is officially supported by Canonical, the company behind this family of Linux operating systems. Any part of that family is the tool that you can start using out of the box, adding necessary components as and when they are necessary. For the most of us, the choice between the parts of the family is merely a choice of visual design of components and workflows. On that grounds I have admitted many times that I am not a GNOME3 fan, so I'll stay away from Ubuntu GNOME edition for now. Good review. I am a fan of GNOME and it is probably my favourite desktop environment. I don't like totem much and I would bin that for VLC. Is the package installer the software centre or GNOME's own software installer? Does it have Rhythmbox or does it include GNOME Music? My favourite GNOME distro is probably Fedora as it provides a complete GNOME experience. 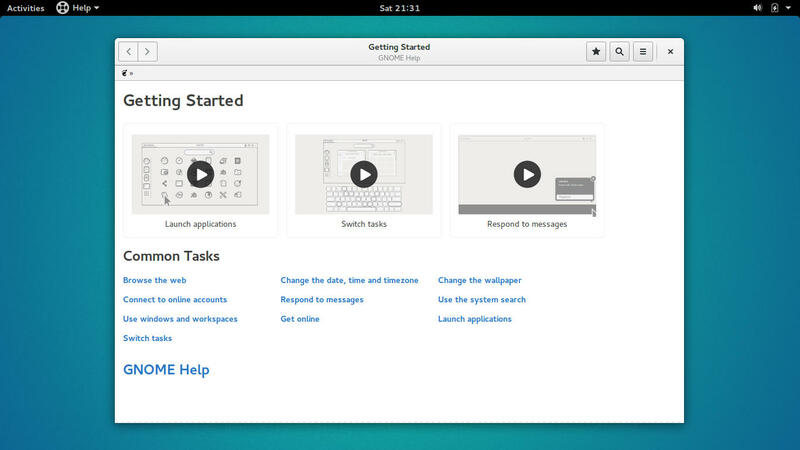 Ubuntu GNOME uses Ubuntu Software Centre. I can't say i like Gnome, 3.18 was a bit buggy when i used it. Does Ubuntu use the same version or they went with 3.16?